With a three-decade history of hosting the DCI Eastern Classic in Allentown, Pa., Drum Corps International once again returns on Friday, Aug. 6 and Saturday Aug. 7 to the venerable J. Birney Crum Stadium for two exciting days of World Class competition. 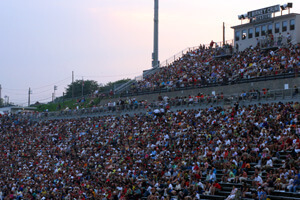 For fans in the East, Allentown will be the place to be as one of the last stops on the DCI Tour before the 2010 World Championships in Indianapolis. DCI Eastern Classic ticket packages giving you access to both nights of competition are now available. Starting at just $30, call 317.275.1212 x3, or order online today.